Joe Klein’s novel Primary Colors caused a stir when it was published anonymously in 1996. A fictionalized account of a Bill Clinton-like governor’s presidential run, it arrived in time to remind everyone of some of the scandals that dogged Clinton just in time for his re-election campaign. Though he had scandals ahead of him, Clinton had no more races to run when the Mike Nichols-directed film version appeared, with less fuss, in 1998. Still in the midst of a post-Pulp Fiction comeback that found him seemingly incapable of delivering a less-than-stellar performance, star John Travolta doesn’t do a direct impression of Clinton. Instead, he gets to Clinton’s essence by portraying his surrogate as a man who finds no contradiction in his warm, genuine empathy for everyone he meets and his desire to win at all costs, even if that means stepping over some bodies along the way. 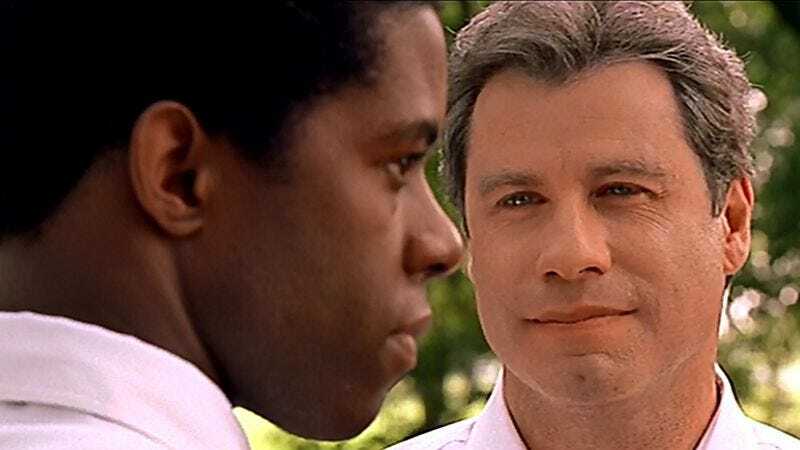 Focusing on the disillusionment of a starry-eyed young operative (Adrian Lester), it’s a fine depiction of how the political process sands away idealism and how when even the best candidate wins, the process of winning means making one moral compromise after another. Availability: It’s streaming on Netflix and available for digital rental on Amazon, iTunes, YouTube, and elsewhere. Also available on good old fashioned DVD.